For Creative blog hop check HERE. I ♥♥♥ Coffee...coffee, cold coffee, coffee ice cream, tiramisu, and everything with cofffee in it. Even my famous brownies have coffee in it...YUM!!!! Amy and Chaitali are the hosting a fun Coffee Lovers Blog Hop! So I decided to join in..
You can find all the participant links at Chaitali Narla's Blog. I checked the mailbox after getting the kids from school and guess what was in it???? A package from Lawn Fawn...with my fave stamp set..YAY!!!! I had to use it for this hop so I whipped up a quick card. I didn't waste time looking for a perfect background paper...just stamped my own using all the yummy Avery Elle inks. 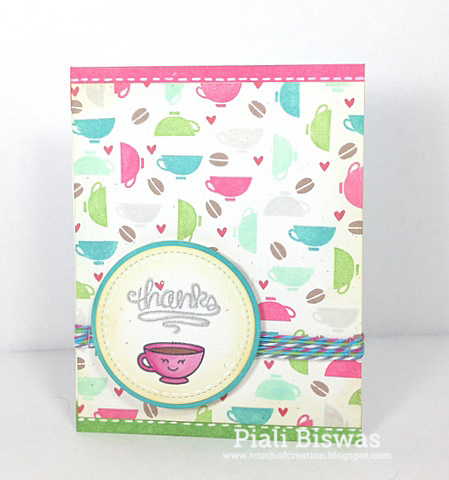 I ♥ this Lawn Fawn- Love You A Latte stamp set. I used a lot of Wink of Stella glitter for the background...its kind of hard to see on the photo. It is very sparkly in real!! Use Your Stuff - Food or Drink. Crafty Bloggers Network - Anything goes. I hope you liked my card...don't forget to hop along to see all the amazing Coffee creations!! Thanks Amy and Chaitali for hosting this hop!!! 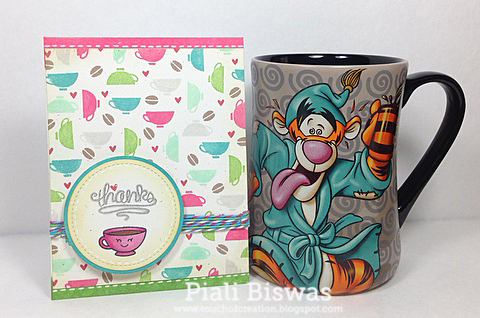 Today I have a special post for one of my very talented crafty friend....ISHA. 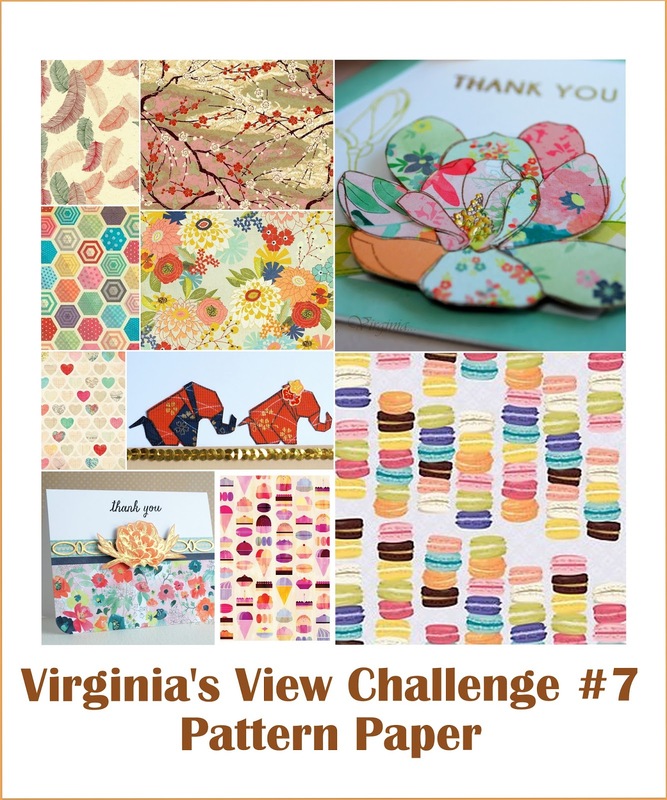 She tagged me last week for a Creative Blog Hop ...you can see it HERE. Isha is super sweet person and amazing papercrafter, she asked to join in for this hop, so I'm here . Writing is not my favorite thing , so I'll keep it short. I have to answer 4 questions and here they are.. I'm currently working on some card samples for Art Impressions Stamps...love their new stamps!! Ok!! Here comes the TRICK question. I don't have a Signature style, so I'm not sure if my work is very different from others. I create in all styles..I love to follow new trends, try out new techniques. My style has definitely evolved , its quite different than what it was 5 years ago. My most favorite style is simple and simple cards with lots of White. I love HANDMADE stuff. I like to give handmade gifts...thats how I started making cards. Now its my favorite hobby. I also make quilts, jewelry and now scrapbook layouts too. I find my inspirations from the products. I try to follow latest trends.When I want to create something I just sit with the stamps and papers...stare at them for a while and then slowly the design comes to my mind. Ok! I might have bored you all a lot with all these Q/A...now here is a card..
Its a fun thing I love doing...Stencils and doodling! 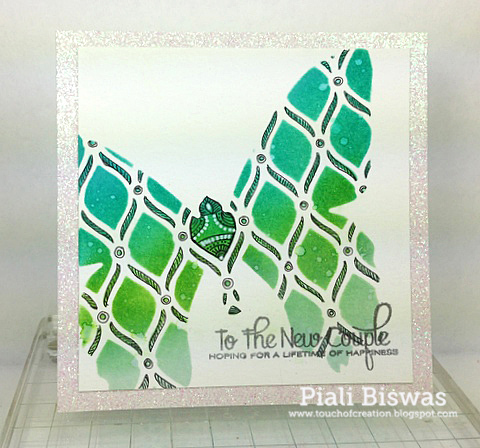 I used Heidi Swapp -Butterfly Layered stencil and Distress inks. Then doodled over it with copic Multiliner pen. Heat embossed the sentiment from Papertrey ink with WOW embossing powder. Addicted to Stamps and More - CAS. A Gem of a Challenge - CAS. First person I'm tagging is.....AMY . Amy is one of my most Favorite paper crafter ....she is the sweetest person ever! Amy has a big contribution in what I'm as a crafter today. In 2009 I started blogging and playing with challenges . Amy was in 365 cards challenge DT back then , I used play regularly, she used visit my blog everyday and leave the sweet comments. She always encouraged me !!! Amy joined this hop already so you can find her post ..HERE. The next crafty friend is from the other side of the globe. She is from my hometown, unfortunately we never met in person. When I was in India in 2011-13 , I virtually meet her thru the blogland . She is a very talented paper crafter and a very sweet person! She is one of the few person who visits my blog regularly and leaves lovely comments. It seems like I joined the hop very late, she joined it earlier than me...so you can read all about her..HERE. I have so many crafters on my mind but all seems to be super busy at this time. She is my migrating crafty friend....whom I love a lot and I wish to be like her when I GROW UP in this crafty world. Now let me tell u why I call her my MIGRATING friend...she lives in Washington for the whole Summer and migrates to Arizona in winter....how fun is that!!!! She is AH-MAZING papercrafter... you should see her die cutting skills, she works MAGIC with the dies..traditional and digital! You must have seen her work in Papercrafts Magazine...she gets published a lot!. As Karolyn just moved to AZ she won't able to join in for the hop now...but I would love,if all just visit her blog and say hi! Hope you all enjoyed reading this post! Thank you Isha for tagging me!!! 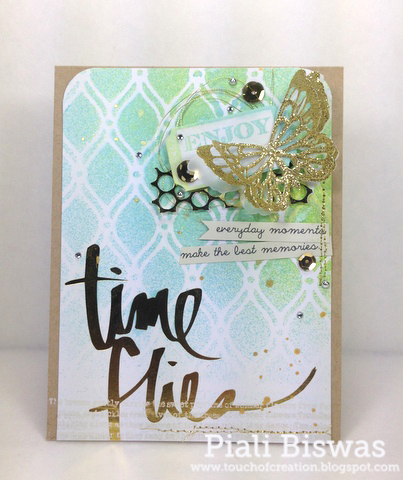 Welcome to CardMaker Magazine- Poppy Stamps Bloghop!!! 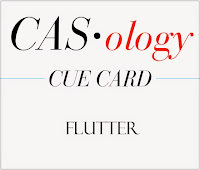 If you are here from Marybeth Lopez's blog , you are right on track, if not please start from CardMaker blog. Today the CardMaker Blog Team is playing with gorgeous Poppy Stamps dies. I love dies a lot and when it comes to dies my most favorite things are Butterflies & Snowflakes. I picked few gorgeous Butterfly dies for my creations . I used beautiful Theo Butterfly die for this card. This die is so pretty & delicate, ♥ it!! I layered American Crafts glitter paper and vellum diecuts. I love the recent Gold trend...its gorgeous!!! I used the Heidi Swapp project Life card and mists. I trimmed the sentiment strip from Simple Stories paper. Cuttlebug Mania - Anything Diecut. Live & Love Crafts Challenge - Things with wings. Artistic Inspirations - Anything goes+/or bling. Simon Says Stamp Monday challenge: Rock the techniques. I used the two dies to dry emboss the background too. I used some gold thread stitch the butterflies and left the loose ends of the thread to give the look of the Antennae. Keep it Simple: No Stamps. 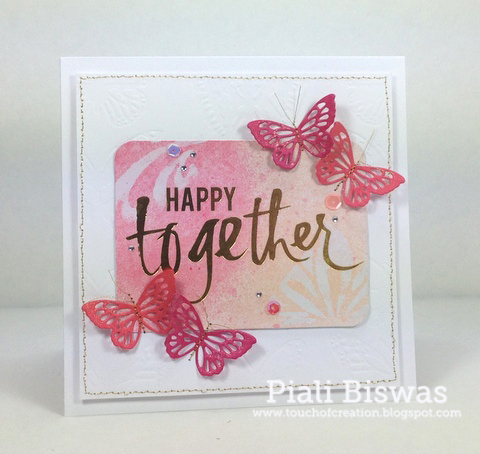 The Pink Elephant Monday Card Challenge - Embossing. Dream Valley Challenges : No stamps. My last card is perfect for the season. Rich, gorgeous colors of the fall leaves are my most favorite thing about this season. I used Leaf Silhouette die. Distress ink and glitter papers work perfectly for this card. The sentiment is from Papertrey Ink. Also added a few gold mist splatters and gold thread stitching. Crafting for all Seasons - Colors of Autumn. Creative Moments - Fall colors. Poppy Stamps is giving away a die set to one lucky winner!!! Hop along to see the gorgeous creations of all the members from both the teams. Here is the Blog Hop List.. I'm back! I'm trying to get back to regular crafty schedule, as the kids are back in School. It is much harder than it seems to get back to regular crafting, I feel lost ...missed so many things around the crafty blogland! I used sketch from the current Waffle Flower Challenge for this card. I changed the tag into a circle. I love this sentiment from WF-Starry Night stamp set. The papers are from Pebbles- Homemade collection. 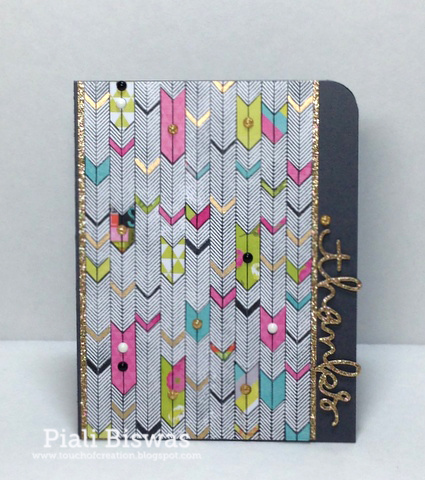 Crafty Hazelnut's Patterned Paper – Anything goes with Patterned paper. Cards Galore Encore - Make a Card. Two winners will receive a stamp set of their choice and join WF team for the next challenge. A random winner will receive a stamp set of their choice. Lots of chance to win fabulous Waffle Flower stamps!! Please email me your addy at piali(dot)biswas(at) yahoo .com. I'll mail the book and surprise goodies ASAP. Today I'm Guest Designing for my super talented friend , Virginia...YAY!!! 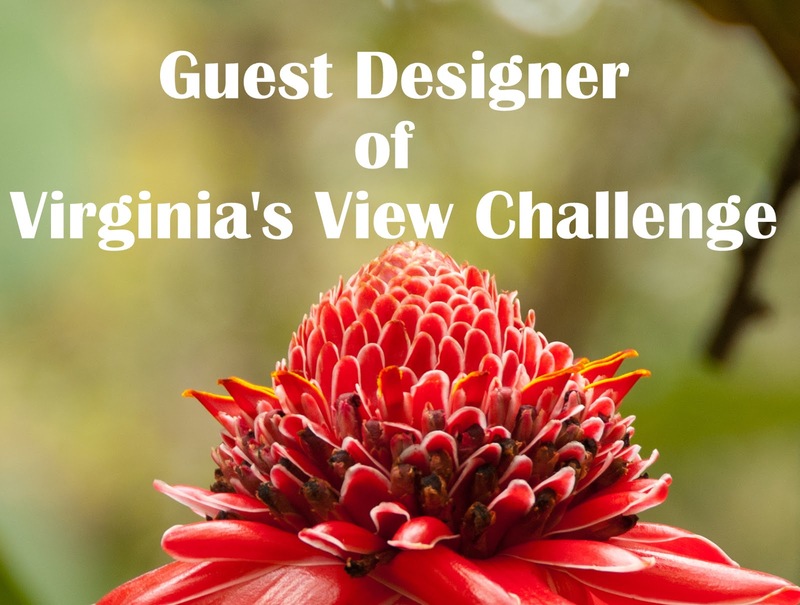 As you all know Virginia runs a very popular challenge called...Virginia's View challenge. Usually I paper piece images...like floral or dresses , etc. Today I used a background stamp for this technique. This gorgeous background stamp is from Hero Arts. I used Heidi Swapp's Favorite Things paper pad . For a more fun look, I painted few chevrons with liquid gold leaf paint. 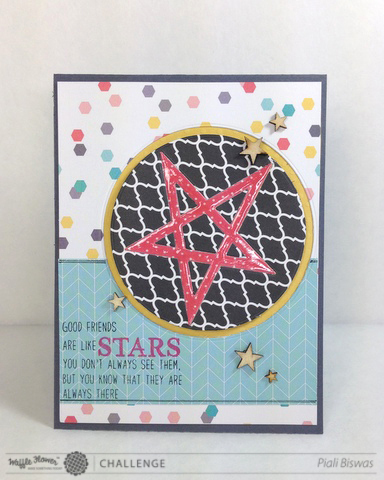 For sentiment I picked Simon Says Stamps' die and gold glitter cardstock. I really like how it turned out!!! Hope you like my card!!! Crafty Bloggers Network -Anything Goes. To play along with VV Challenge#7 , please visit HERE. Thank you Virginia for having me as your GDT this month!! !